Prices of the Galaxy S9 and Galaxy S9+ continue to slip lower. The latest eBay deal from a US seller sees the Plus model go for $755. You can find it here, only black units are available. This is for the SM-G965F/DS model – Snapdragon 845 powered, dual SIM, 64 GB storage. The units are fully unlocked. 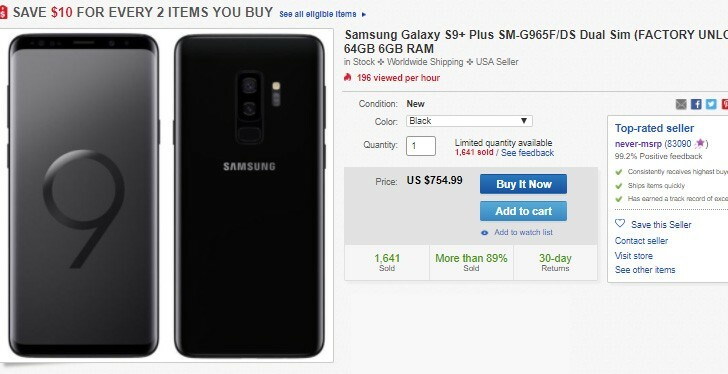 If you’re not comfortable going through eBay, you can grab a Galaxy S9 from Best Buy for $720 – that’s the regular price, but you get a free Samsung SmartThings kit. It includes motion sensors, sensors for doors and windows and a smart outlet. The same deal is available for the S9+ ($840). Note that this kit has an MSRP of $250. Blackshark from Xiaomi much better option for less than half the money and same specs bigger battery and ram.